LEARN NEW CONCEPTS - BOOK YOUR SEMINAR NOW! Deprecated function: The each() function is deprecated. This message will be suppressed on further calls in _menu_load_objects() (Zeile 579 von /homepages/6/d323044072/htdocs/kungfu-trainer.com/includes/menu.inc). 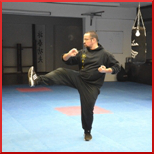 Ving Tsun Kung Fu is designed as a very efficient combat system. For this reason the system emphasizes power, precision, speed and balance in conjunction with the right principles. For example the centreline theory, the principle of economy of motion, and the constant forward force. But the most important weapon in Ving Tsun Kung-Fu is the mind. So we train this mind force right at the beginning in our first form, the Siu Nim Tao. If you put two men together with equal skill, the big guy would always win. If you are not as good or as big as the other guy, timing is very important. My goal is to provide an excellent training to achieve the right timing depending on speed and coordination. Sigung Wong Shun Leung encouraged his followers to prove and test the knowledge that he gave. Where necessary to discard it, refine it or improve it. Even if you do not want to “change” to the Wong Shun Leung method, open your mind to concepts that will enhance your own personal development regardless of your Wing Chun lineage or chosen style. Whether you belong to an association or not plays no role. The goal is to learn Ving Tsun (Wing Chun) Kung-Fu authentically and completely as a unique science of combat. Ving Tsun Kung-Fu (Wing Tsun) is widespread around the world, many people are enthusiastic about this type of Kung-Fu. Unfortunately, Wing Chun is often not fully understood because of the lack of knowledge or an incomplete education. If you are ready to expand your knowledge and want to learn this martial art completely and authentically, I offer you an honest opportunity without secrets. The Chi Sao training is a partner workout in which we are in a constant exchange of power with our partner. We always try to find a direct way to the target. Chi Sao is not fighting, it should only help us to build up the right reflexes for the fight. The goal is to quickly get in an advantageous position. In Chi Sao there are some important things to consider. Apart from the fact that one should always be on the shortest way to the goal, we always have to maintain our body structure. For example the head as the highest point. If you move your head to much you constantly need a balancing movement and because of this movements you finally become unstable. When the basic stance is practised correctly you can develop a feeling for your center of mass. When you know how to control your center of mass during Chisao, you can absorb incoming forces. If you are not able to keep your balance, all techniques are useless. If the typical stance is executed with the necessary principles, it helps you to develop a feeling for your center of mass. When you get this feeling, you know exactly how you have to handle incoming forces to maintain your balance. These and other basic rules of the Wing Chun (Wing Tsun, Ving Tsun) are first things you have to understand in theory and at the same time to be felt by practical examples. The "experience" is an important part of the training, because this effects are difficult to put into words. With the focus on meeting our target with great control, we have some special training methods in Chisao combined with dynamic exercises on the focus mitts. The precision and body coordination are trained by favorable movement patterns and fast changes of direction. Additional training on the wall- and heavy bag gives a clear feedback on the right line of force, body mechanics and endurance. After the basic elements are mastered, the pressure in the Gohsao and Sparring can be increased. Now new physical and mental deficits are breaking up. This way we can isolate wrong behavioral patterns and eliminate them by individual training. 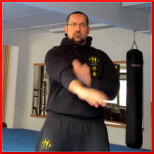 Last but not least, the quality of your attacks, the "Ving Tsun Shapes" and the "Chisao Training" in conjunction with the right exercises are effective tools to master this task perfectly. If you have already learned the first two forms (Siu Nim Tao, Chum Kiu), you are ready for the wooden dummy (Muk Yan Chong). This training tool improves your feeling for the right distance, timing, body structure and much more. You will notice that many ideas and techniques of the wooden dummy training are taken from our first two forms. Often, a new type of body control occurs after only a short training period. Your movements are now getting faster, more precise and more effective. The training on the wooden dummy should not be executed too fast and not too slowly. A common mistake is the use of too much muscular force. In Ving Tsun Kung-Fu the required force comes from the entire body structure and attacks exclusively the center oft the dummy. The correct way is always to hear one clear sound, in the wrong version it is only noise. There is no reason to wait for the dummy training unnecessarily long. This tool was developed as an excellent training tool to sharpen your abilities at an early stage. 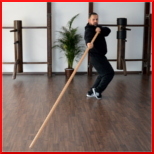 If you want to improve your punch and coordination, you can use the longpole training (Lok Dim Boon Gwan). The longpole training requires many and regular repetitions. You will learn a new way to generate speed, maintain your balance and improve your explosiveness. Now you will learn to deal with heavy lever conditions and master them. Your body will learn to act precisely and controlled even under extreme conditions. For this training you should not wait for years. On the contrary, the longpole training can help you to focus on elementary important behaviors. The training with the long pole is an extreme burden for the untrained body by its unfavorable and unusual leverages. Only with experience and the use of an intelligent body structure the pole suddenly becomes "light". Footwork, balance and elbow strength gives the rotations and linear motions of the Luk Dim Boon Gwan the necessary dynamic. If you can move well in the unarmed Wing Chun, it's time for the double knives (Baat Cham Dao). Now, due to the exceptional circumstances, new advantageous methods are being developed. Any wrong movement can be fatal. So in the "Wing Chun" Baat Jaam Dao training the distance changes. The way we generate forces as well as the way we perform our footwork. Now you get a special footwork to improve your coordination. Mastering this weapon requires a lot of skill and sweaty exercises. One more reason to start in time. All the exercises described above are training tools that should get you to your goal faster and easier. For this reason they were developed by humans for humans. The developers of this martial arts pursued their traditionally logical approach not only in fighting, but also in the training setup! In my seminars you learn to inspire your students and also to convey your skills and knowledge in a lasting way. In private lessons or weekly seminar it is an advantage if you already have Ving Tsun (Wing Chun, Wing Tsun) experience. As an instructor you are teaching and creating other people, so you should be able to put yourself into your disciple. All martial artists also have a responsibility to their students, to themselves and their martial arts. I am convinced that all martial arts schools, with their trainers and assistants, teach from conviction and passion. 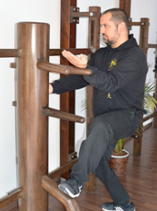 The aim of all Wing Chun (Wing Tsun, Ving Tsun) styles should be to ensure a high quality training for the students. As a requirement oriented training, it doesn`t matter whether you want to be a trainer or already teaching a training class. In the seminars I am teaching the following aspects. 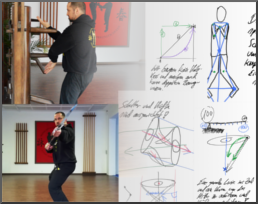 • Biomechanics in the Ving Tsun Kung-Fu: force, recoil, gravity, lever laws etc. WING TSUN, VING TSUN or WING CHUN? Actually it is only about the phonetic translation of two Chinese characters 詠春 which in Europe usually refer to the same origin, namely Yip (Ip) Man. When Yip Man came to Hong Kong in 1949, the city was an English colony (1843-1997) and the most common foreign language was English. The Chinese term 詠春 can be called phonetically in the English language as Wing Chun, which is still used as a upper term. Since Wing Chun is abbreviated also called "WC" and thus provide grounds for ridicule, Yip Man opted for the spelling Ving Tsun Kung Fu. Also because of the "V" like Victory, the term seemed to him to be more appropriate. After that, he founded the first Ving Tsun association based in Hong Kong in 1967 (5 years before his death). The "Ving Tsun Athletic Association". 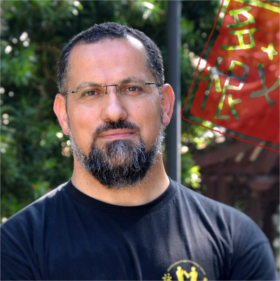 To distinguish themselves from other teachers and classmates, some instructors also use the spellings such as Wing Tsun, Wing Tzun, Wing Tjun or Yong Tjun (Chinese Mandarin). There are also a lot of Wing Chun associations in Europe like the EWTO, WTEO, WTAS, IWKA, IWTSA, DVT ... and many more. For me the individual conflicts of spelling Wing Chun is secondary, because all of the instructors should have the goal to pass this unique martial art authentically and complete to the next generation. This first form is the most important, our entire combat concepts are built on this form. It trains body and mind. In our stance (Yee Ji Kim Yeung Ma) the muscles in the body are strengthened and the spine is relieved. This form teaches the ability to coordinate your own body precisely and consciously. Important elements are to occupy the center line, the alignment (Chiu Ying), or the elastic forward pressure (Lat Sau Jik Chung). This second form is moving our first Siu Nim Tao form. It teaches the development of the force from the hip rotation (Juen Ma) and the beginning of the footwork (Seung Ma). Also the concept to use both arms at the same time is taught. This form leads up to more efficiency and speed. A combat is very dynamic and the opponent is not a cooperative training partner. 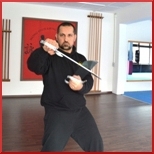 The Chum Kiu gives us important tools to focus on the target, to chase the opponent (Jui Ying) and even in difficult situations to control your balance. The Ving Tsun theory is a perfect combat system. However we are not computers to implement a theory to 100%. The Biu Jee form takes us outside the Wing Chun “Box” and represents a sort of emergency technics to deal with in hopeless situations. For example when we have been hurt, fight against several opponents or weapons are used. The goal is to regain control to limit our own damage. 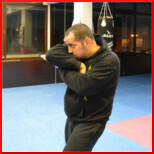 In order to adapt quickly to extreme situations, this form is very dynamic and breaks with some important basic ideas of the Siu Nim Tao or Chum Kiu form. 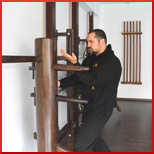 The wooden dummy form contains elements from all three previous forms and is taught according to the second form (Chum Kiu). It can also be seen as a 24 hours available training partners. As an important training tool, it is used to improve distance, timing, coordination and attacking angles. The body is trained to move as a compact unit. When practiced correctly the practitioner receives a clear feedback to bring his skills to a higher level. The longpole training improves your control, balance and body coordination. This form with his special training drills (solo- and partner drills) creates an enormous structural force. The deep Shaolin stance (Sei Ping Ma) in conjunction with a close rear elbow on at the ribs, teaches explosive action with the power from the ground. This form does not necessarily have to be trained towards the end of the curriculum. Training the longpole after the second form chum kiu offers an excellent addition to your everyday training. The concepts and angles of this form are quite different than in the empty hand training. The eight cutting knives are almost entirely dependent on the sharpened edge of the blade for power. For this reason it is not advisable to facing our armed opponent frontal. We want to flank our opponent by a special footwork. The knife techniques are a specialized way of using the open hand actions. This is where speed, timing and fighting spirit can be further developed. I started training in martial arts in 1987. Like many other children of my age, I was impressed by the martial artist on TV. So I started in a martial arts school for Tae Kwon Do. At the same time I gained experiences in kickboxing, boxing and ju-jitsu. I trained hard 5 times a week until I had the first contact to Wing Chun (Wing Tsun, Ving Tsun). I found many theories logical and effective, so I decided to devote all my energy to this Kung-Fu fighting style. I have been practicing and teaching this logical method of combat since 1995. Within 3-4 years I had achieved the Instructor-Level in a large European association and was nevertheless dissatisfied. My further development in Wing Chun (Ving Tsun, Wing Tsun) should be interrupted by politics and horrendous costs. However, I loved Ving Tsun too much that I would just leave this passion behind me. So I was ready to go outside the box and invested a lot of money. I participated in seminars all over Europe and took private lessons from great masters in Hong Kong. I also had the privilege to meet a lot of great students of Sigung Wong Shun Leung. For example Sifu Man Kim Au Yeung, Sifu Le Hang Cheong, Sifu Chan Kim Man, Sifu Lam Kam Kuen, Sifu Wan Kam Leung, Sifu Wong Hong Leung, Sifu Chiu Hok Yin and others more. I am very grateful for the support of these great teachers and the ongoing friendship with some of them. Today I am a member and certified instructor of the VTAA "Ving Tsun Athletic Association" in Hong Kong. This Association that was founded in 1967 by Ip (Yip) Man himself. Today, I am teaching a lot of experienced Wing Tsun/Ving Tsun masters and teachers from many different Wing Chun lineages. These students are from different countries and mostly have more than 20 years of Wing Chun experience. As a "self-correcting system" I am teaching Ving Tsun (Wing Tsun) as an effective combat system which is based on his scientific approach. The path to perfection goes beyond the self-knowledge and is a continuous process. We are not programmable robots and human errors always can happen. However, for each mistake Ving Tsun Kung-Fu provides also a clever way of correction. These skills can only be learned through personal guidance of an experienced coach. My goal is to teach Wing Chun in a complete manner and save the practitioners from unnecessary waiting periods. Because for many practitioners the loss of time is even worse than the loss of money. For further questions you can write me via the contact form. BOOK YOUR SEMINAR-No matter what country you live in! Do not hesitate to contact me, please fill in the contact form!